We’re packing up and almost ready to leave for Loscon — Diana, Sierra and I. And I should arrive with the new issue of File 770 under my arm, if crowds of Black Friday shoppers aren’t clogging the local Office Depot. I expect to post from the con now and then. We’ll see how that works out. Sue Ann Barber and Trevor Clark won the 2009 GUFF race (Get Up Fan Fund, this time around). They will attend the UK Eastercon in April. They edged Alisa Krasnostein and Norah Ding (aged “almost two,” with her mother). Voting ended November 24, with the pair receiving 88 of the 118 ballots cast. Francis Hamit, author of The Shenandoah Spy, signed his book at the CalNational Bank branch in North Hollywood, California, on November 15. He donated ten dollars of the money received for every book sold to the new West Los Angeles Fisher House at the VA Hospital, and collected additional donations. Fisher House is the no-cost residential faciliy for the familes of wounded veterans. How did he do? The answer is in this article at the Military Writers Society of America site. Seven developments of interest to fans. (1) There’s a wacky music video tribute to John Williams making its way around the web, where a fellow sings four parts a capella while combining some of Williams’ memorable movie themes with filk-style lyrics. Natalie Morales: Did you kill John and Linda Sohus? Clark Rockefeller: My entire life, I’ve always been a pacifist. I am a Quaker and I believe in non-violence. And I can fairly certainly say that I have never hurt anyone. (6) Aaron Ross Powell tells about his experience selling a draft novel on Amazon’s Kindle. In what looks to be a reaction to the economic downturn, manga publisher Broccoli Books, the U.S. branch of Broccoli International, a Japan-based international producer of anime, manga, games and pop culture merchandise, will close at the end of this year. Broccoli Books is based in Los Angeles. From the start Mel Brooks suffered from being, well, Mel Brooks. His previous show, “The Producers,” quickly crashed through box office and award records. There’s a story that after “Oklahoma!” opened, Oscar Hammerstein II asked a friend what he should do next, and the reply was “Shoot yourself.” Topping the top is always tough, but the creators of “Young Frankenstein” also seemed to suffer from excessive hubris. 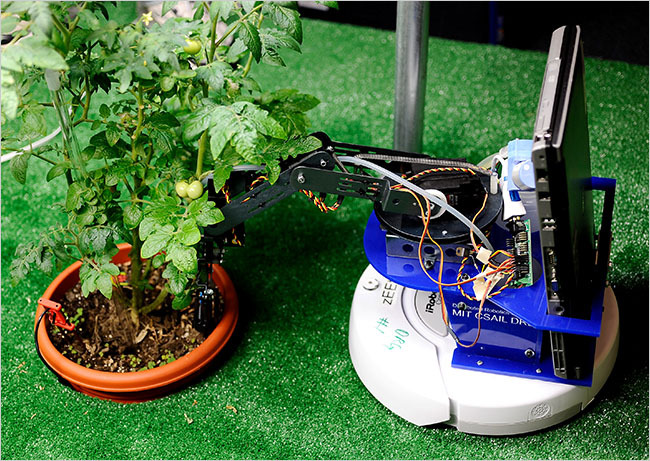 “Silent Running gardeners are here,” thought Andrew Porter, the moment he saw a picture of the MIT robot that will water a tomato plant when the plant makes a request. A moment later he returned with something cute and bouncy balanced on the palm of his hand. It was basically a little cube attached to a cross, outfitted with a series of small plastic propellers, some lights and wires, four orange plastic pontoons that could easily have been scavenged from a bath toy, and a rudder that looked like a popsicle stick. So this was a model of the robotic helicopter? “No, this is it,” Dr. Roy said. “This is the robot itself.” And it was just one of several working prototypes, he added, that the lab and collaborators from around the world had built from off-the-shelf parts. ROFL! — It’s time for the Intercollegiate Quidditch World Cup! She plays Quidditch, the international sport of the wizarding world, which has players zooming around on broomsticks and using balls to score points and knock one another off course. The earthbound variation is called Muggle Quidditch. The sport originated in 2005 when a student at Middlebury College adapted the game for the nonmagical world. Its popularity quickly spread, and today more than 150 colleges throughout the United States have Quidditch teams…. Middlebury College won the Intercollegiate Quidditch World Cup. Vassar College came in second, and Chestnut Hill College placed third. For more information about Boston University Quidditch, visit the team’s Facebook page. By John Hertz: The birthday party for Forry Ackerman that Ray Bradbury hosted on Saturday, November 22nd, at Bookfellows (also called Mystery & Imagination bookshop) in Glendale was full of people, books, a cake, Ray, a theremin, and a giant card we all wrote good wishes on. Forry’s 92nd is Monday, November 24th. We sang Happy Birthday to Forry by phone, for which he thanked us from his home, the mini-Ackermansion. He is physically weak but his mind is sharp. The cake was chocolate. It had a big photo of Forry in a blazer with his First Fandom badge, and a big photo-montage of monsters. Ray spoke eloquently. So did George Clayton Johnson and other friends. That night was a small unbirthday party for another member of First Fandom, Len Moffatt, who was only 85 on Thursday, November 20th. I asked Ray if he’d like to sign a card for Len, and he said certainly, so I went across the street and made one at a copy shop. Len’s wife June had contributed a 1972 photo of Len for the cover of APA-L 2271 last Thursday, so I used that. APA-L has been published every week for only 44 years. The photo was from Westercon XXV where Len was Fan Guest of Honor. It shows Horrible Old Roy Tackett, Len as the clown Pike Pickens, Stan Woolston, and in back Dan Alderson. After Ray, I went over to Forry’s so he could sign it. A nurse’s aide let me in. Forry said “I’ve always enjoyed you over the years,” which I told him was mutual. I took the card to Len’s party and confessed it was another ruse to dodge the no-presents rule. At his 80th it had been a balloon. LASFSian Richard Foss displays his versatile writing talent online at two great venues this month. In this litany of books about disaster, disorder, dysfunction, and dystopia, are there any that portray an unreservedly sunny portrait of a future L.A.? Alas, no. Utopias are boring, and whatever Los Angeles is, has been, or might become, it is not dull. If someone writes a book where it is, that would be fantasy. Also, Foss’ novelette “To Leap the Highest Wall” is in the current issue of Analog.